With the aim of creating awareness of the latest technological developments and providing a platform for development of skills required for addressing the techno-legal issues arising out of it, Symbiosis Law School, Pune, in association with Surana & Surana International Attorneys, Chennai announces the 14th Surana & Surana International Technology Law Moot Court & Judgment Writing Competition, 2015. Venue: Symbiosis Law School, Pune. Eligibility: The competition is open only for students who are pursuing LL.B (three year or five year programme) during the current academic year. To augment technology related research a team have the option of having only one student member (must be an undergraduate) from technology / science discipline (other than law), from any institution approved by the HOD or the Head of the Institution. There will be a two-tier Registration Procedure. The participating colleges shall have to register both with ‘Surana& Surana International Attorneys’ and ‘Symbiosis Law School, Pune’. The registration opens on May 14, 2015 (Thursday). 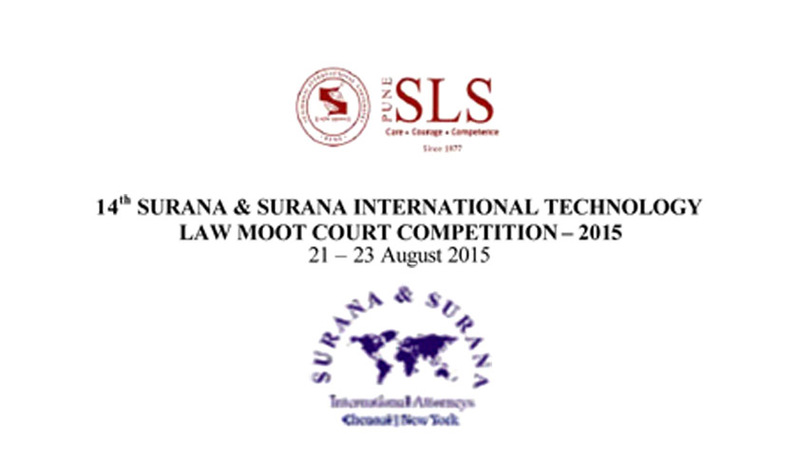 Registration with Surana & Surana International Attorneys: The teams must register online at www.mootsite.com / www.moot.in by July 18, 2015 (Saturday). The soft copy of the memorial for each side shall be a single file and in MS-Word. It shall correspond with hard copy of the memorial. There should only be two word documents (All parts of each memorial must be in a single document), one for Claimant and the other for the Respondent. Each Memorial should not exceed more than 40 A4 pages. The "Arguments in Detail" and the "Prayer" should not exceed more than 25 A4 pages. The Cover Page of the Memorial must have the following color scheme: Blue: Claimant Cover Page Red: Respondent Cover Page. a) The Team Code should be mentioned in the upper right-hand corner. For instance, if the Team Code of the Participating Team is ST_150; the Memorial Code on behalf of Claimant would be “ST_150_A” and for the Respondent would be “ST_150_D”. d) The party for which the Written Submission has been prepared. e) Name of the forum resolving the dispute. All participating teams must submit a soft copy of their memorials from both the sides on or before August 02, 2015 (Sunday) by 09:00 p.m. IST. Teams must send 3 Hard Copies of the memorials [Total 06 copies] which should reach Symbiosis Law School, Pune by August 05, 2015. The remaining 3 Hard Copies of the memorials (Total 06 copies) should be submitted during orientation on August 21, 2015. Typed on standard A4 size page. Font size for body text: 12; the text of the written submission must have 1.5 (1.5 lines) spacing. Font size for the cover page may be 14 or 12. Margin: 1 inch margin on each side of the A4 size page. The footnotes must follow the 19th Bluebook format of citation. The Memorial must not contain any Annexure/Photographs/Sketches/ Exhibits/Affidavits etc. Eligibility: The teams participating in the Surana & Surana International Technology Law Moot Court Competition. Submission: a) The judgment should be written and submitted in .doc or .docx format on the last day of the international moot court competition, i.e. on 23rd August 2015.
b) Participation in judgment writing competition is compulsory for all the teams and researcher from each team shall represent the team in the competition. 3rd and 4th best will be awarded certificates. d) All the participants who have submitted the judgments would get participation certificates. The winners (winner / runner up) would be awarded respective plaque and individual certificates.